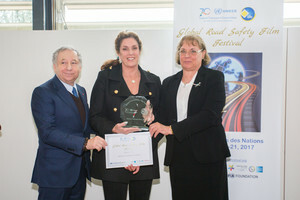 UNECE and Life announced today the winners of the 2017 Global Road Safety Film Festival. Among the top three winners were a film about drink driving, and two films about distracted driving. The winner of the Gran Prix Prize, “Reflections from Inside Dawn” produced by NGO “We save lives” from the United States, addresses drink driving. The film shows an actual prison inmate who was convicted of drunk driving after killing a police officer, literally reaching out to club-goers via a video link and encouraging them to take responsibility for their behaviour before getting behind the wheel. The two runners up films Distracted driving kills, Don't use your phone, produced by the Slovenian Traffic Safety Agency (3rd prize) and Distracted Driving, produced by the Road Traffic Safety Research Center of Ministry of Public Security of the People’s Republic of , China (2nd prize), powerfully displayed the consequences of paying more attention to a smart phone then the road. The increased use of smartphones has led to far more distracted driving incidents. In 2014, in the US alone 3,179 people were killed, and 431,000 were injured in motor vehicle crashes involving distracted drivers. One of the best tools for ending distracted driving is through education and films like the two runners up provide an emotional and vivid view of the consequences. The film festival is the product of the UNECE teaming with LIFE, UN Secretary General’s Special Envoy for Road Safety, Jean Todt and Hollywood talent including actress Michelle Yeoh and filmmaker Luc Besson. Every year 1.25 million people are killed and around 50 million injured in road traffic crashes, making it one of the most pressing health emergencies of our time. Every day 500 children lose their lives because of road crashes. It is the leading cause of death for young people aged 15 to 29, and the eighth leading cause of death globally. The film festival, which is being held in conjunction with the 70th anniversary of the Inland Transport Committee (ITC), aims to raise awareness as well as providing tools for education about road safety issues. The festival was overseen by a high level jury including Jury President Jean Todt, UNECE Executive Secretary Christian Friis Bach, United Nations High Commissioner for Human Rights Zeid Ra’ad Al Hussein, President of the International Olympic Committee Thomas Bach, filmmaker writer producer Luc Besson, Actress Michelle Yeoh, and Actor Jean Reno. The festival collected 232 films from countries across the globe including countries such as the Islamic Republic of Iran, The Dominican Republic, Malaysia, China and Tunisia. While all films were required to have English subtitles many are in the language of the country of origin. This makes them perfect teaching and awareness raising tools for road safety campaigns.